*After all discounts. Some products do not qualify for free shipping. If you return an order, we will deduct our actual postage cost from the refund amount. If you place your order before 2PM CT, we will process and ship your order the same day (except weekends and holidays). Essentially, we will give your order to the shipping carrier the same day that you placed the order. It does not mean that your package will arrive the same day that you place your order. Order right now: We ship today. We pride ourselves on offering affordable shipping options wherever you may want our items. Please review our international shipping FAQ for more details. We've shipped to over 70 different countries and to every state in the union. Click here for a complete list of countries to which we ship. Please note that free shipping only applies to orders shipped within the United States. We insure all packages shipped internationally against loss and theft. Any claim made for a lost or stolen package must be done within 90 days of purchase. 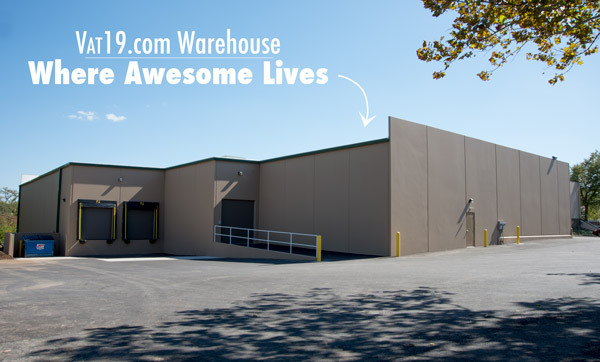 Every item on Vat19.com is stocked in our warehouse in St. Louis, MO. As long as your curiously awesome items are listed as "in stock", your entire order will ship together all at the same time. Our centralized location ensures fast delivery to the entire US. We prepare every order carefully to ensure that you get the items you have ordered as quickly as possible without any delays or broken items. We double-check every order and ship all orders received before 2PM CT the very same day*. We want to make your experience with Vat19 a pleasant one. Hopefully, you'll be so impressed you'll tell your friends about us!